Veronica was educated at Berkhamstead School for Girls. She trained initially to be a teacher of physical education and dance at Bedford College of Physical Education in 1940 – 43 and later as a physiotherapist. Her first teaching post was at Cheltenham Ladies College 1943-46 followed by her return to Bedford as a lecturer in Dance 1947-49. Her professional career spanned almost 50 years, as a lecturer in Dance and Movement in numerous teacher training college and universities; and as an external examiner in Physical Education and the Art of Movement for higher educational establishments. As a student in Bedford she attended a two day course given by Rudolf Laban. This was to have a deep and long lasting effect on Veronica. From 1946-47 she studied with Laban and Lisa Ullman at the Art of Movement Studios in Manchester. 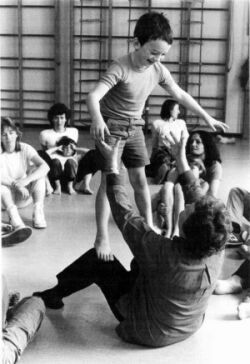 She was then invited to work with him on his book Modern Education Dance (a key source of information on the understanding of movement). In his acknowledgement Laban refers to her as Veronica Tyndale-Biscoe. “From Laban I learnt a different understanding and awareness of the human body and its movement. In my own work I have applied Laban’s theories to the needs of mainstream children, children with special needs and pre-school children. During the last thirty years I have worked with classroom teachers, physical education teachers, drama teachers, physiotherapists, speech therapists, occupational therapists, nurses, nursery teachers, nursery nurses, and teachers in special education; and I have brought up children of my own. Veronica was invited to introduce her movement work to teachers and therapists in Norway, Sweden, Canada, Australia and Poland and later in Finland, Estonia and Belgium. Since her death training has also taken place in Japan and other European countries including movement projects in Romania. Veronica wrote many articles for journals including New Era and Special Education. She contributed to several books e.g. Drama and Theatre (Heinemann Publications); Physical and Creative Activities for the Mentally Handicapped, edited by Graham Upton (Cambridge University Press 1879); Creative Therapy pp 680-90 edited by Sue Jennings (Pitman 1975). In 1990 Developmental Movement for Children was published. Six training videos were made between 1965 and 1986; three of these have been selected for preservation by the National Film Archive. 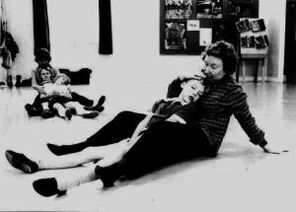 In 2000 material relating to Veronica Sherborne and Developmental movement was placed in the Archive section of the University of Birmingham, Library. In September 2001 a second edition of her book was published by Worth Publishing (ISBN 1903269-04-0).